Address, contact telephone number and google map so you'll have no problem finding us. Have something a little more bespoke? From the small to large projects we'll be able to fit you in. 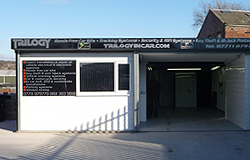 Trilogy was formed in 1997 by Tim Doyle and has been a specialist in car audio and security for over 25 years. Not being tied to any specific hifi manufacturer we can offer virtually any brand of unit, from a head unit to a full system. We can provide what you require! We can provide you with standard or tailored security systems for your car, van or bike, whether you have a standard production car, homologation special or a one off custom / modified car that wants something special. Protect yourself and your passengers from bogus whip lash claims and on road incidents. As more and more vehicles are being taken by stealing the keys, these devices don't rely on you having to arm them, they are passively set (Self Setting) or remotely set via text. Modern vehicle tracking uses GPS for absolute accuracy and reliability. A small discrete electronic box is installed within the vehicle being monitored.